Yesterday, February vacation week officially started for some of the schools around the country. Since many parents may be desperate for things to keep their children entertained 2 or 3 days into this school vacation, I thought it would be a good time to share a new free printable activity. 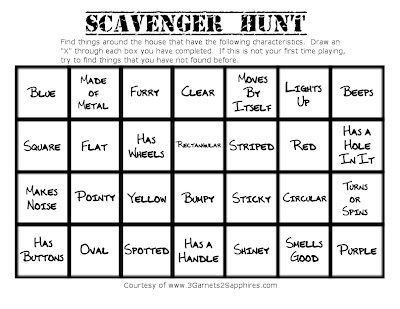 This is a basic scavenger hunt activity I designed to be suitable for preschoolers and grade school-age children as well. It also can be used whether you have an only child or more than one. The main goal is to find an item in the house that has one of the characteristics listed. This is a great rainy day activity. 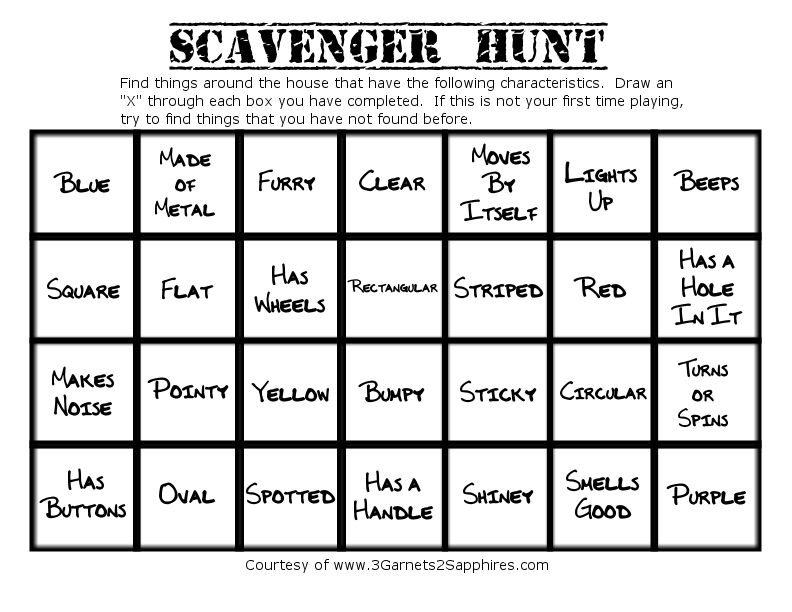 Ways to use this Scavenger Hunt activity . . . If your child is too young to read, then you can either read off each item on the list for your child or make it a group scavenger hunt where an adult or an older child is playing along and trying to find the items. If you only have one child and he or she can read, then you can have them complete this activity more than once. Each round will increase in difficulty because they cannot use the same items more than once. If you have 2 or more children who can read, then you can split the children into two or more teams, giving each team its own list. Whichever team finds an item for each characteristic first will win. TO PRINT: Click on the image below to enlarge. Then right-click on the image and select print. Use the back arrow on your browser to return to this page. If you try out this activity with your children, I would love to know how they liked it.